Why would anyone want to merely bang out music, when you could have euphoria? Why be satisfied with an ordinary spinet when you could have The Emotion Organ? Developed over a rigorous three-year period in a small studio in Norway, Amanda Steggell’s The Emotion Organ is a synaesthetic, simulacrum machine that takes its public on a phenomenological journey through the physical senses. With the organ, you can hear colors and smell sounds. The Emotion Organ is also a time machine. 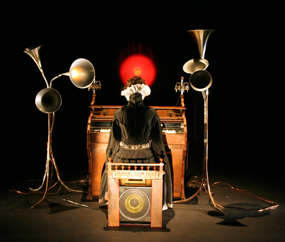 It connects obsolete technology with the new, combining a 19th century organ with contemporary gadgetry to create a hybrid form that is part performance object and part scientific instrument for studying phenomenon. When playing the organ, various combinations of chords and foot pedals trigger cross-sensory events, such as the projection of visual patterns, vibrations, and/or emission of compelling aromas. Each viewer is invited to play the organ and come up with his or her own set of discoveries. As a sculptural object used to explore processual practices, Steggell’s The Emotion Organ is an exciting contribution to a contemporary artistic practice and redefinition of artistic roles from makers to facilitators that enable the exploration of complex relational, networked and social experiences. The Emotion Organ will be installed within the Women’s Art Resource Centre (WARC) and be offered to the public to explore and perform with. You are allowed and encouraged to touch the art! The exhibition will open with an introduction to the organ by the artist followed by a special evening of performances by both established and up-and-coming Toronto musicians who will create live improvisations using The Emotion Organ. Amanda Steggell, artist, born in Yokohama, based in Norway, works all over the place. She has a background in dance/choreography and is Associate Professor at Bergen National Academy of the Arts. Her interest is in the allurement and uncanniness of technology and its related devices with which she shares her life. As a collaborative and solo artist, her interdisciplinary work combines and shifts across the scope of the performing, visual, sonic and media arts. She has worked extensively with digital and communications technologies since the mid-1990s when she also co-founded the Motherboard project with Per Platou (www.liveart.org). In 2007 she gained a PhD-alternative qualification for artists in Norway for her artistic research in synaesthesia and contemporary live art practice. Her solo work is currently seeping into science/technology museums in the form of participatory installations as well as in public space as urban interventions. Born in Canada, Michelle Teran is a media artist currently living in Berlin. In her work she explores the interaction between media and social networks in urban environments. She develops performances via the staging of urban interventions such as guided tours, walks, open-air projections, participatory installations and happenings. She has received numerous grants and awards for her work including the Prix Ars Electronica honorary mention for Interactive Art, the Vida 8.0 Art & Artificial Life Award and the Transmediale Award for 2010. Eve Egoyan is a concert pianist who specializes in the performance of new works. Her intense focus, command of the instrument, insightful interpretations, and unique programmes welcome audiences into unknown territory, bridging the gap between them and contemporary composers. Composers have a uniformly high regard for her performances of their works, often considering them definitive. Gordon Monahan’s works for piano, loudspeakers, video, kinetic sculpture, and computer-controlled sound environments span various genres from avant-garde concert music to multi-media installation and sound art. As a composer and sound artist, he juxtaposes the quantitative and qualitative aspects of natural acoustical phenomena with elements of media technology, environment, architecture, popular culture, and live performance. Toronto-based composer and performer Martin Arnold studied in Edmonton, Banff, the Hague, and Victoria, where his teachers were Alfred Fisher, Frederic Rzewski, John Cage, Louis Andriessen, Gilius van Bergeijk, Rudolf Komorous, Douglas Collinge, and Michael Longton. Martin is a founding member of the Drystone Orchestra and from 1995-2000 he was artistic director of The Burdocks. Currently he plays guitar, banjo, melodica and live electronics in Marmots and Cow Paws as well as in bands led by Ryan Driver and Eric Chenaux. Martin works as a gardener and teaches in the Cultural Studies Department of Trent University. Toddler Body, formed in early 2008, is the double side-project of Randy Gagne (Disguises, Man Made Hill) and Greydyn Gatti (Wolfcow). Originally conceived as a recording project via emailed exchanges of Mp3s, TB explore the murkier side of post-apocalyptic synthesizer pop, Sci-Fi disco, and creeped-out soundtrack music. They are currently devising a method of performing through the transmission of pure psychic vibrations.